This very realistic view of the moon is a rendering based on detailed maps of the reflectivity and height of the lunar surface from NASA’s Lunar Reconnaissance Orbiter. The bright crescent is directly illuminated by the sun but the rest of the disc is glowing faintly in light reflected from Earth — the earthshine. Astronomers have managed to detect the telltale fingerprints of organic life on Earth using a new technique that examines sunlight reflected onto the moon by our planet. The so-called "earthshine" observations may pave the way for a similar tool to help spot signs of alien life in the universe, scientists say. "With earthshine observations, what we do is use the moon as a giant mirror," said study lead author Michael Sterzik, deputy director of the European Southern Observatory's La Silla Paranal Observatory. "The sun illuminates the Earth, and that light is reflected onto the moon — but the side of the moon that we usually see as the dark portion." The researchers then analyzed this reflected light using the European Southern Observatory's Very Large Telescope to look for signs of life, or biosignatures. These markers include specific combinations of gases in Earth's atmosphere that could only exist in tandem with some form of organic life, the researchers said. The crescent moon and earthshine over the European Southern Observatory's Paranal Observatory. This picture was taken on 27 October 2011 and also records the planets Mercury and Venus. Earthshine observations have been done before, but Sterzik and his colleagues took it one step further, and developed a new approach to take into account the polarization of the light, which enabled them to make more detailed and sensitive measurements. "All light is polarized, but the most primitive way to measure light is to take its intensity, or its strength, but that's just one part of the information," Sterzik explained. "Light also carries information about its polarization state and information about how it is generated or scattered." The researchers used this method, known as spectropolarimetry, to examine the earthshine, and found that biosignatures on Earth showed up very strongly in the reflected light. 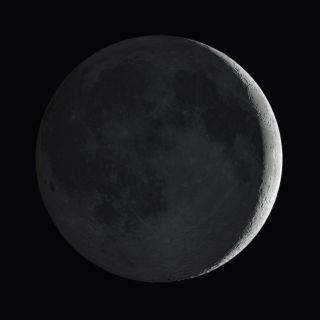 By observing earthshine astronomers can study the properties of light reflected from Earth as if it were an exoplanet and search for signs of life. The researchers studied the color and degree of polarization of the light that was reflected from the surface of the moon. They were able to distinguish details and changes on the planet's surface, and also observed that Earth's atmosphere is partly cloudy. "On the surface, we can distinguish land surfaces and ocean surfaces," Sterzik said. "We even see signatures of vegetation, which is an interesting and unique marker of biological activity. We could essentially see the greenness of the vegetation canopies." And while the existence of life on our planet is no great surprise, spectropolarimetry could be a valuable tool in the ongoing search for life on worlds beyond Earth. "We believe that precise usage of these spectropolarimetric techniques has promise for exoplanets," Sterzik said. "It's currently being applied to giant exoplanets, not because we expect to find life, but just to inspect the atmospheres. With giant telescopes and more dedicated instrumentation, the technique may be a pathway toward finding primitive biosignatures on other planets in the future." In fact, the approach has its advantages, because of how difficult it is to directly observe light signatures from distant alien planets. "The light from a distant exoplanet is overwhelmed by the glare of the host star, so it's very difficult to analyze — a bit like trying to study a grain of dust beside a powerful light bulb," study co-author Stefano Bagnulo, of the Armagh Observatory in Northern Ireland, said in a statement. "But the light reflected by a planet is polarized, while the light from the host star is not. So polarimetric techniques help us to pick out the faint reflected light of an exoplanet from the dazzling starlight." Powerful next-generation telescopes, such as the European Extremely Large Telescope, which is currently being constructed in the mountains of Chile's Atacama Desert, could one day be used to pick apart the atmospheres of exoplanets for telltale signs of life, the researchers said. "Finding life outside the solar system depends on two things: whether this life exists in the first place, and having the technical capability to detect it," study co-author Enric Palle, of the Instituto de Astrofisica de Canarias in Tenerife, Spain, said in a statement. "This work is an important step towards reaching that capability." You can follow SPACE.com staff writer Denise Chow on Twitter @denisechow. Follow SPACE.com for the latest in space science and exploration news on Twitter @Spacedotcom and on Facebook.